As if we didn’t have enough to worry about, an acclaimed website gleans sophisticated anxieties for our consideration from a cohort of well-educated, highly influential people. Each year, literary agent and Edge.org founder Brockman (Thinking: The New Science of Decision-Making, Problem-Solving, and Prediction, 2013, etc.) asks dozens of scientists, academics, authors and artists (in roughly declining order of representation) a thought-provoking question to which he invites a brief response. This year, the author asked what people should worry about that is “under the radar,” or what is on the radar that isn’t worth worrying about? In this collection, climate change and the impending collapse of the world financial system are relegated to supporting roles, giving way to a more eclectic hodgepodge of concerns, many reflecting their authors’ professional backgrounds. The physicists tend to worry about the disastrous effect that the lack of public support for big science projects, like the Large Hadron Collider, is already having on future discoveries and theories. A number of neuroscientists are anxious about the effect of information technologies on the minds and language of young people. Few worry about overpopulation; in fact, several participants propose a projected collapse of the global population curve toward the end of the century as cause for worry about how the youthful minority will cope with a superabundance of seniors. 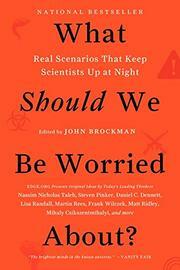 A little of these worries goes a very long way, and reading this collection can soon oppress readers: Imagine 150 very smart people taking turns trying to outdo each other with bad scenarios no one else has thought of. Instead of reading straight through, dip in and sample the ideas of the likes of Steven Pinker, Daniel Dennett, Sam Harris, Mary Catherine Bateson, Evgeny Morozov, J. Craig Venter, Brian Eno and many more obscure but no less erudite thinkers. You will be surprised, you will learn a lot, and indeed, you will have a higher quality of things to worry about.